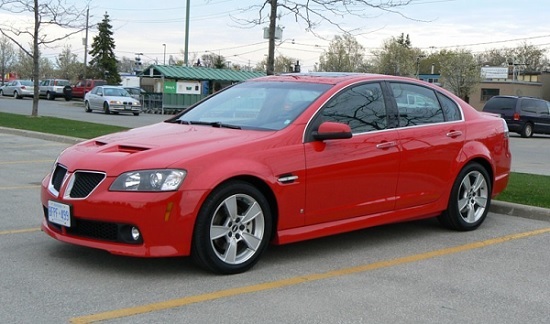 We are very pleased to be the premier Pontiac G8 V6 tuner in North America with the only made to order tuning service. In keeping with Overkill tuning tradition, this G8 V6 retune is an extensive recalibration of the factory tune to improve overall performance but also address some key driveability dislikes. One thing we know for certain is you'll love what an Overkill G8 V6 tune will do for your vehicle. Improved fuel mileage potential and fuel mileage consistency. Both regular and Sport mode driving heavily revised for better upshift and downshift points. Holds upshifts longer, downshifts with less throttle. Sport mode provides a noticably sporty shift pattern. Prerequisites for a tune - For the engine and transmission tune, you're required to run 91 octane or higher, however no other engine modifications are required. An air intake and any exhaust work will help improve performance. For the transmission only tune, no modifications are required and of course the fuel requirements remain unchanged from the factory. HP Tuners Suite: The best way to provide our Overkill tuning is to sell you your own HP Tuners suite. You'll need a laptop to read, scan and flash from inside your vehicle. You can then provide us with your factory file, we provide Overkill tuning, you provide scans and we provide revisions as needed. The benefits are receiving Overkill tunes for both 87 and 91 octane, which you can switch between by flashing the vehicle, and the ability to datalog (scan your engine's operation while driving) and receive easy tune updates based on those scans to build a tune that's more customized to your particular vehicle. You can also receive tune updates for new modifications. 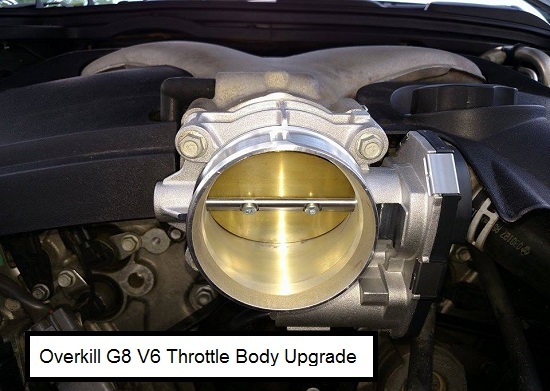 Available exclusively at Overkill is the only larger throttle body upgrade for the LY7 3.6 engine. Not a "ported" factory unit, this is a true larger throttle body, 76mm versus the factory 71mm. For your G8, the gains are simple: more airflow at all throttle positions, significantly better throttle response, bolts right on with no wiring or manifold modifications required; inlet porting on the manifold is suggested to maximize the improvement in airflow but not required. No tuning is required for this upgrade! Tech Tip: This won't fit the factory intake tubing. If you have a K&N system, your intake elbow will fit over this new throttle body. If you have a Rotofab, you'll need a 3.5" straight silicone coupler from a silicone coupler supplier. Include new Throttle Body coupler?